How many times have you come to renew your home insurance only to give it a quick glance over and sign on the dotted line? I know I’ve been guilty of this in the past and haven’t even bothered to look at whether the policy covers me adequately for the contents that I own. But it’s something we really should take better notice of and ensure we have adequate cover. Several years ago before I met him, my husband was burgled. Twice in the space of a few months in fact. One thing he says when he talks about that time is how difficult it was to replace all of the items that were taken or damaged. And he didn’t always get the same things replaced automatically which was really sad. If you have special attachment to your belongings you would hope to get the old item replaced with a new one exactly the same. I know that’s what AA Home Insurance does so it’s worth looking at the small print of the policy. One thing that strikes me about home insurance and our material possessions in particular is how frequently we undervalue them. For example if you were to stand in your living room and look around at everything there in the room, can you give an estimate of its value? I’m sure you could give it a good go. But once you’ve done that, can you then start to make a list and value every item individually. I bet you would very soon start to reach your estimate value before you’ve finished listing out all of the items. It’s actually quite shocking how much it would cost to replace the items you own. Things like tv’s for example, the rug, the pictures on the wall, your DVD collection, laptops, iPads and so on, are worth a lot of money and when added up together can reach a staggering total. We did this in our home a few years ago, creating a value list for all of the rooms in the house. It was a great exercise, a little time consuming perhaps, but one well worth undertaking. It showed us that we were definitely under insured and needed to address the situation. Of course, that was a few years ago and we should probably go through the same exercise again this year; it’s incredible how much the value of your home contents can change. 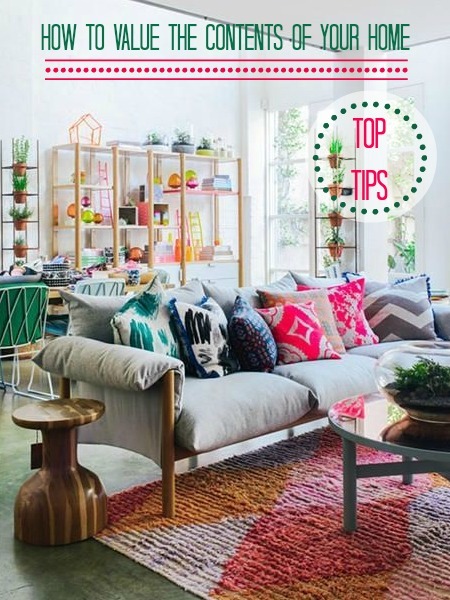 If you do make a record of your home contents do ensure you file it externally. Should your home be the victim of fire or flooding and everything is lost, it will be of no use if the document is stored on your home computer or in a desk drawer. Send it to a trusted relative perhaps or store it safely online so you can access it at a later date, when you need to make a claim. You insurance company will want details, receipts and even photographs of the items so try and pull all this together just in case anything bad should happen.